How to set up Google sync with Outlook Folders? It has never been easier to set up Google sync with Outlook. In order to sync Google and Microsoft Outlook you will need to create a synchronization profile. The Sync2 synchronization Wizard makes it simple for you. Select that you want to use Internet for Microsoft Outlook synchronization and choose Google data to sync - Calendar, Contacts, Tasks or all three. Enter the Google Account information and in a few moments Sync2 will sync your data automatically. Repeat the same steps on as many computers as you want, using the same Google Account login. You can synchronize Outlook with Google Contacts, Calendar and Tasks in both or only one direction. By default, Sync2 will sync Outlook and Google data in both directions. It means that Outlook Calendar, Contacts and Tasks will look identical as Google Calendar, Contacts and Tasks. The changes made on any side will be automatically transferred to the other. 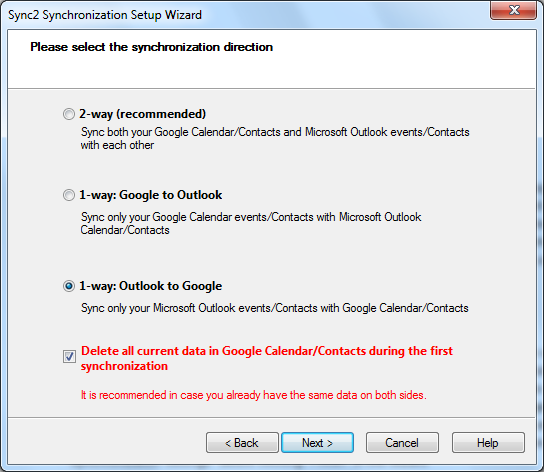 Sync2 also allows you to set up one-way synchronization between Outlook and Google services. It means that you can choose to transfer contacts and/or calendar only from Google to Outlook and vice versa. In order to select a direction, check the “Configure advanced synchronization settings” before clicking “Finish” in the wizard. 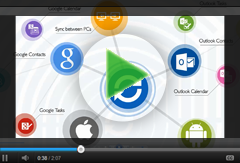 What are Google - Outlook sync benefits for user? Google Outlook sync allows you to reach Microsoft Outlook Contacts and Calendar via many other devices. Microsoft Outlook synchronization with Google Account provides your Outlook data access through the Internet. As you have Outlook and Google services in sync, your calendar and contacts are reachable via Android, iPhone, iPad, Blackberry or other smartphones. This solves many problems of those who use Microsoft Outlook, Google and a smartphone and have different sets of contacts and calendars on all of them. Sync2 eliminates the need of manual calendar and contacts updating in both places - Outlook and Google. If automatic synchronization is set up, everything you change in Outlook Calendar or Contacts will be updated automatically in Google and vice versa. One-way sync allows you to transfer contacts and calendar events from Google to Outlook, or from Outlook to Google. That way you can keep one side unchanged, and have everything on the other. One-way synchronization creates you a backup copy of Outlook Calendar and Contacts in Google and vice versa.